Planning a summer party and suddenly discover your pool water is green? Are you the kind of person who constantly has green pool water no matter what you do? Does it seem like there is no way to get rid of the algae in your pool? Swimming pool algae is a small plant organism that likes to grow in warm, poorly circulated, un-sanitized water. 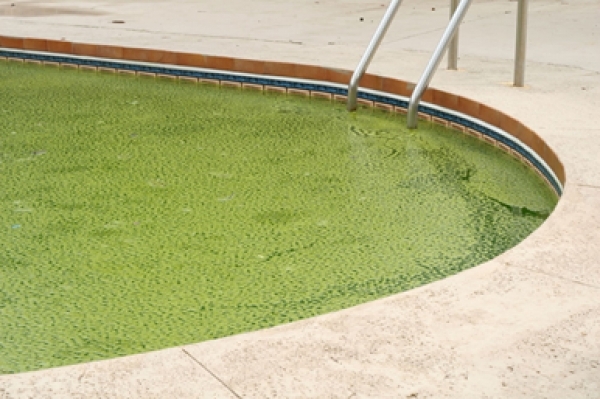 The most common pool algae is green in color and spreads very fast. You’ll need to act quickly and always be on the lookout for an algae outbreak. The strength of algae is determined by color. If your pool water is light green, it means you’ve caught the algae at an early stage of growth. It has not taken over your pool yet, and should be easy to overcome with a few simple steps. If your pool water is dark green or black, you have a stronger type of algae to defeat. This algae is more powerful and has taken over your pool. You can easily defend yourself against an algae attack using the right sanitizer, good filtration and the proper circulation. This is your secret weapon. Algae finds it difficult to grow in flowing water with a proper level of free chlorine. Algae is also likely to cling to the surfaces of your pool and work its roots into the floor and walls. Areas of poor circulation, such as steps or corners of your pool the automatic cleaner doesn’t get into, are where you’ll find algae beginning to bloom. Keep the walls and floor of your pool clean by regularly brushing with a stiff pool broom attached to a telescopic pole. Vacuum your pool once or twice a week (more if needed). Skim the surface of your pool water everyday. Run your filter and pump for 8 to 12 hours per day. pH should be between 7.4 and 7.6. Alkalinity should be between 80ppm – 120ppm (parts per million). Free chlorine level should be at 2ppm. Use a weekly dose of algaecide. Brush the floor and walls then let the pump run for 12 hours. CAUTION – do not add acid and chlorine together into the pool water. For safety reasons always space the addition of any chemicals added into pool water about 30 minutes or more apart. Always follow the manfacturers guidelines. Also make sure to keep an eye on the filter pressure gauge. If the pressure gets into the red range, turn off the pump, clean the filter, then restart the pump and run until the pool water is clear. If your pool is dark green, repeat process above however add double the amount of pool shock and algaecide then run the pump longer. When algae is dead it turns into a bleached white skeleton, causing the water to become cloudy. Once you have reached the cloudy water stage add a good quality clarifier into the pool and run your pump for 12 hours.